Almost nine months after their release in Europe, Bridgestone's new T30 sport touring tires have made their way across the pond. The new T30 is a replacement for the BT023, and claims an improvement in dry performance, wet grip, and longevity. The Bridgestone T30 Tire is the first Bridgestone tire carrying the “T” designation for a Touring application. Going forward, Bridgestone tires will be “T” for Touring, “S” for Sport, and “R” for Racing applications. In order to deliver on the promise of better grip and handling, the front tire now has a new “T” shaped groove that delivers high stability in a straight line, while increasing the front contact patch in a lean for better grip. The construction of the tire itself has been modified to give a rider greater feedback and lighter handling. 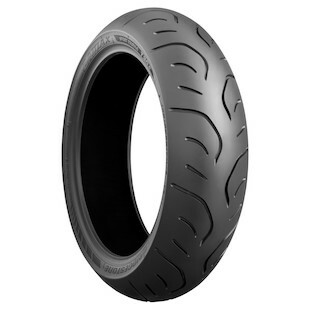 Bridgestone is using a new MotoGP-derived rubber compound at the front and rear that allows the tires to perform over a broader temperature range. 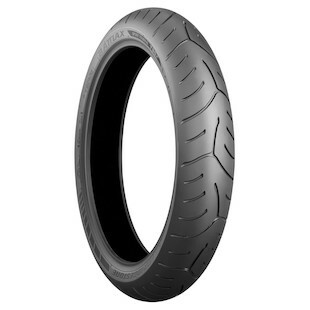 The tread pattern on the Bridgestone T30 Rear Tire features a dual compound construction, and utilizes a semi-slick shoulder for edge grip. The grooves used in the rear tire allow for an improved contact area with the road, while still maintaining tire stiffness for longevity when riding upright. The Bridgestone T30 Front Tire comes with a single compound construction. The new T30 will come in Standard applications as well as a GT version for heavier bikes like the BMW R1200RT or the Yamaha FJR1300.